Pointless fence, originally uploaded by Stephen Rees. Vancouver is not going to the the Greenest City while nonsense like this is allowed to continue. The seawall around False Creek is something to be proud of. 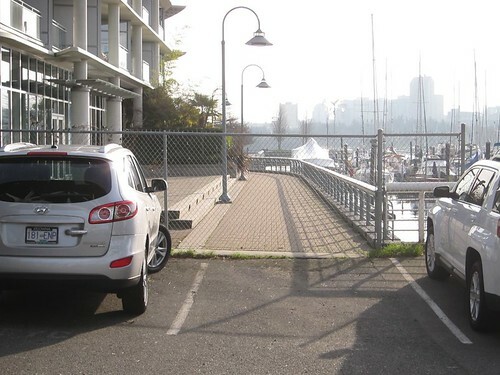 But the walking route is blocked – on the north side underneath Granville Bridge by the parking lot of the Vancouver Yacht Club. Now this might make some sense if the parking lot was fenced all round, with a locked gate. But that is not the case. The lot is open to the west and north – for vehicular access, and thus easy to use by pedestrians too. Just not this way. For a city with a transportation policy that says pedestrians come first this is utterly incomprehensible. It must date back to the bad old days of cars first and the interests of the privileged few trump those of the general public. Yes, it does seem ridiculous. – the parking operator (if it’s a pay lot) won’t give it up. In either case, if the City wants it to add to the seawall, presumably it could negotiate a fee for its rental each year (and the landowner’s added insurance costs of funnelling a pedestrian pathway into a parking lot). I remember during the Olympics, the dragon boat facility over by Science World temporarily rented space in this same parking lot for a storage container and a trailer, since the east end of False Creek was a restricted zone for the months before and during the Games – so maybe someone is being stubborn. That fence has been in place since the development there (that includes the seawall) was being constructed. Its original purpose was likely to keep people from the parking lot from falling in to an active construction site. Yes, that fence has always annoyed me. Gordon Price ran a one-man campaign to remove the temporary (5 or 6 year!) float plane terminal that sat on the Coal Harbour seawall, and thereby complete that section of the seawall. I think that the same thing needs to happen here. And I agree with Bryn. It is possibly a holdover from when the condos were constructed there. I am sure that the residents of that condo building would prefer that the fence stay there.